London, 1953, 1st UK edition. 300 pp, 48 plates. If you want to collect just one book signed by Ed Hillary, this is probably the one to have. The official account of the first ascent of Mount Everest; this is the first book written about the climb. Chapter 16 on the on final assault was written by Edmund Hillary. The book and dust jacket are in very nice condition, DJ, Near Fine - Fine. No writing in the book, DJ may have the most minor edge wear. 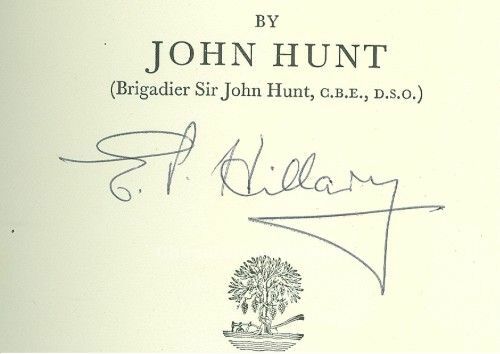 We personally obtained this signature in person in one of our several meetings with Edmund Hillary over the past thirty-five years.